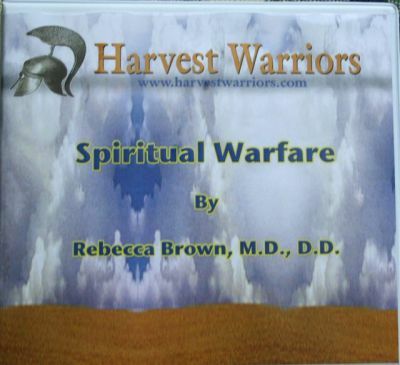 In 2004, Dr. Brown was asked to teach a graduate course in spiritual warfare at Zoe University in Jacksonville, FL. Zoe University decided to open up these meetings to the public, so many Christians attended as well as students. This set of CDs is a recording of that course. There are 18 CDs, and more than 15 hours of lecture, plus several question and answer sessions. Rebecca is powerfully anointed by the Holy Spirit to teach. This is a comprehensive in-depth study of spiritual warfare that you will not find anywhere else. There is a lot of information on these CDs that is not in Rebecca�s books, or in any of her times of ministry in any church. Your life will be changed as you prayerfully listen to these CDs. We encourage you to fully participate in the sessions on Breaking Generational Curses and Personal Deliverance. The handout used during the course is included with this package. Price $100 per set. * This may sound like a lot of money, but there are 18 CDs in the package which comes to only about $5.00 per CD.